I took Hoggie to the desk this morning to replenish his food and thousands of ants were swarming over his food and water. I typically keep his dry food and bowls in a 9 x 13 baking pan for this situation. This way, I can fill the pan with water and prevent them from getting to the food. I keep his wet food on a dessert plate perched on an upside down bowl. The problem is if food drops into the water, you don't notice it until the smell knocks you over so, I don't keep water in it unless I have an ant problem. But I'm not smoking over it. Hope you can get rid of them. I hate ants. 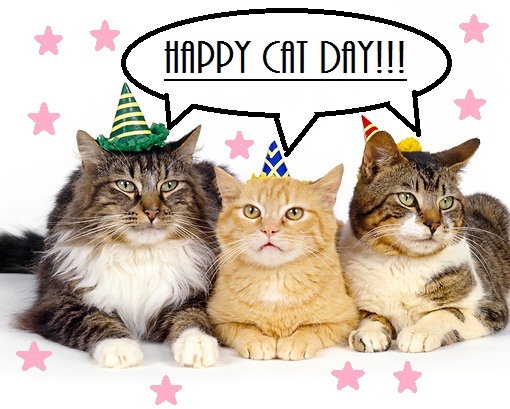 But be sure to treat Hoggie to something special today-because it is National Cat Day! I may just not tell him. Well he is a pretty sharp cat - hope he doesn't hear it on the news - lol You will be on his list for a long time Dale. I hate ants too!!! One year, before we replaced the door to the kitchen, they found a crevice in the wall behind the frame of the door and nested there. I had to call an exterminator, because even after using tons of vinegar (as I heard natural deterrent) they were still making their way through the kitchen to the food bowls, even empty. Every morning I was spending nearly an hour cleaning the kitchen floor, and outside, around the door, on the patio, cleaning drenching everything in vinegar. The exterminator showed me where they nested in the door frame and also put some traps in the backyard, and just like that, they were gone. I hope you can soon find a way to keep them away from you and Hoggie! I sprayed them with my deodorant. It riled them and they left. Coming back soon as a deodorized mob. If I can't find my Terro I'm going to WM later. I think it was Jennifer-Quit-05-01-14 who told me to spray a mixture of peppermint oil and water and that it would deter them. I did that on my side porch where the recycling bins live...I had SO MANY ants that it was creeping me out. I sprayed and unless it rains really hard and rinses all of the peppermint mixture away, I don't have any ants there any more. I sprayed around window sills and doorways to the outside to keep spiders away too. NOT a fan of either. I use the peppermint oil for spiders - so far, knock on wood, I don't have an ant problem. Jennifer-Quit-05-01-14 it works on ants too...I have recommended it to people and they have told me that they could not believe it and it smells SO GOOD. I have to spray around basement door...that's where the MEGA spiders like to show up. I don't like ants either. They surely try to take over. We had the nest problem to and I not only found ants in empty bowls, but they some how made it into my cereal boxes and other things in my pantry. Needless to say war was on. We exterminated in and around the patio door in the kitchen. I hope your deodorized mob don't come back. We had a pretty bad infestation of sugar ants in my area for a bit and I swear by the terro brand liquid ant bait. I struggled for months and then once I started using those, the problem subsided. I get ant hills on my grass, I sprinkle powdered tide on them with a little bit of water and that worked. Also have used ant be gone, lol. Thank you all for your comments, I've learned a lot about ants, and not having them, and just placed an order with Amazon for the Terro liquid and bite. Even though I had the exterminator at the house last week, and told him about the ants too, it was not the main reason for the visit. It was the Palm tree roach who visits our home from time to time, making me scream like a crazy person!!! I used to have a bug man and twice/year good treatment kept them away. I don't want the every couple of months contract, so after my bug man moved, I did not have the treatments regularly. So back to ants, they are the little ones looking for sugar, and he used some gel in on the sink and inside a pantry. They don't bite, but I had to discard almost 2 lbs of sugar from a glass container, they are so small, the container's lid is so heavy, I would never understand how they got inside it. Daniela-3-11-2016 I remember those roaches...one got under a paper bag I was using for garbage and the bag of garbage was moving across the kitchen floor...the cat was terrified which was NOTHING compared to MY terror. Those things are like small animals. I am NOT a fan.